My hair grows phenomenally fast. For instance, I cut off 10" to do a Locks of Love donation 10 months ago, which made it fall just above my shoulders. Now it's already down to the middle of my back. Therefore, I had to teach myself how to trim my own Bettie Bangs because I didn't have the time to schedule a bangs trim at my old local salon, even if they were free. So, thanks to YouTube tutorials, I was able to figure out how to do it myself. If I'm in the mood, and I have a great deal of time, I tend to go with the tips on this video from the "Jane Dears." They're very very particular and thorough. And I especially like the layers tip, where you pin back layers at a time and trim each one from forehead and back I keep the very first layer a bit shorter, which helps with keeping the hair curled under even if I don't have time to use a curling iron. 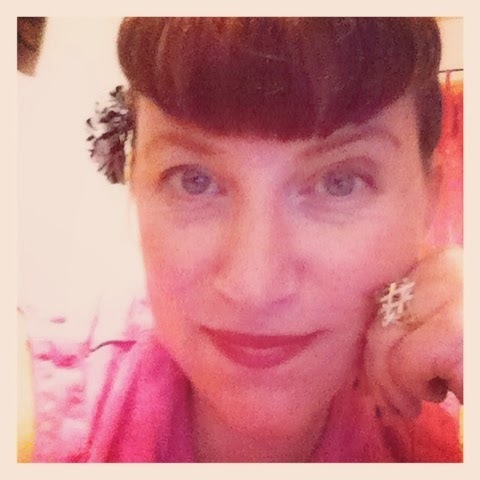 For a really quick trim, because I don't have much time to get my bangs trimmed, usually before a vacation, I go with Cherry Dollface's super quick Bettie Bangs tutorial. Also, I just really like Cherry Dollface as a person. She's sweet, inclusive, and seems to care a lot about her followers. And remember, if you screw up, as Alice Walker says, "Hair is God's most natural toy." Bettie bangs don't have to be perfect; that what curling irons and hair spray is for. I have lots of cool retro hair style pics on my Pinterest Board "Bettie Bangs 'n Style Stuff Like That." I have amassed quite the collection of Pinspiration for retro hairstyles on that board! Good luck going down that super fun click-hole.